The response to STONE AGE has been overwhelming, and there are a lot of opinions out there: I loved it!, I hated it! It’s so believable! It’s unbelievable! Here is your chance. Tell others your feelings about STONE AGE. Tell others about what you liked or didn’t like; what you would do if you were one of the characters; why the science was believable or not believable. NOTE: Please offer *Spoiler Alert* if you are revealing something about the book. We want those that haven’t read the book to get the chance first. This entry was posted in Stone Age - Book #1 on May 22, 2014 by StoneAge. 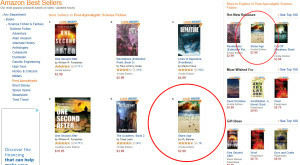 STONE AGE has taken Amazon by storm (literally), rising to be an Amazon Best Seller in many categories! Yesterday, STONE AGE surpassed Hugh Howey’s, Sand to become the #6 overall Best Selling Post-Apocalyptic book in all of Amazon’s eBook collection; #5 overall in Dystopian fiction. Additionally, STONE AGE remains one of Amazon’s Hot New Releases (until tomorrow, when it is no longer considered “New”), rising to as high as #2 in the same genres. Take heart readers, STONE AGE – New Realities, the second book in the series is being worked on, with an expected publishing this Fall. To receive updates on release dates and any specials that may be offered readers of STONE AGE, be sure to add your name to ML Banner’s Survivor Update mailing list (http://mlbanner.com). This entry was posted in Announcements on May 6, 2014 by StoneAge.